Time has to be our most valuable commodity and it’s one where there can never be enough! As we age, our time is even more precious because we are aware of approaching expiration dates. When I began losing my eyesight I viewed time as the enemy. You see, when you experience a major life-altering event like sight loss it impacts Every. Single. Thing. You. Do. Every. Single. Day. Tasks that used to take minutes to accomplish can now take an obscene amount of time complete. The urgency of carrying out time-intensive projects compounded by my physical disability can sometimes be overwhelming. Stress followed by panic attacks are typically the result of applying an extraordinary amount of pressure on myself to perform. Adapting to our disabilities, being flexible, and creative are critical steps in our ability to thrive within our circumstances. When we are able to identify and get rid of time-sucking elements in our lives, it can be a real game-changer. What About Wardrobe & Makeup Tasks? One of my guilty pleasures is watching YouTube makeup tutorials. I’m so fascinated with the amount of time spent and products used by many YouTubers to apply their makeup. The artistry involved in these makeup transformations is something to behold. In comparison, my makeup routine is child’s play but it’s one I’m completely at ease with. Personally, I do so much better working with less which is why I downsized a few years ago. Fewer items in my wardrobe, makes it easier for me to create combinations that I’ll actually wear. Keeping it simple with versatile pieces is another rule I follow. For example, take the decorative headgear I’m wearing in the featured photo. It can be worn in several different ways not to mention it saves time on hairstyling. 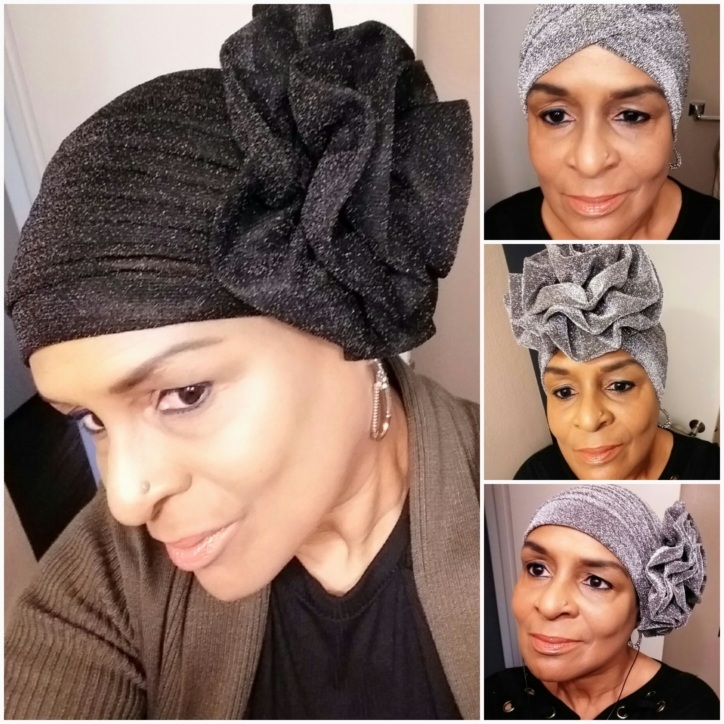 Wigs, hats, scarfs, headwraps, are all, in my opinion, necessary accessories. They are also the easiest ways to create a quick fresh look. There are two vintage flower twist pleated stretch turbans in today’s post, one black, and one silver. What makes these pieces versatile are the placement of the flower. You can wear it on the right, left, front or back of the head. I got these ones from Amazon and they have several different colors from which to choose. The sparkly threads add a little extra pizzazz. Seeing as I’m now in the third quarter of my life, my time is more valuable than ever. While I take pride in my appearance it’s no longer the most important thing to me. So being able to look nice while saving time allows me more time for those things that take priority. I think being protective of our time is the first step to making better choices in our lives. Once you realize what you are willing and not willing to allow into your life it’s freeing. A four-panel collage of mirror selfies. There is one big photo where I’m wearing the black headwrap with gold threads an the flower is over my left ear. Three smaller photos show me in the silver one with the flower to the left, front and back of my head. Previous post: Sportin’ Spanx & A Little Black Dress On Election Day? I agree with you Patty on wearing it sideways although the other day I tried wearing the black one with the flower in the back and I liked it that one as well. Yes, everything literally takes twice the time, or more. I followed your closet thinning tips with great results. Less works better and takes less time. Amen! For me, it helps clear my mind as well. Clear Spaces = Clear Mind. And these days my sanity is priceless.